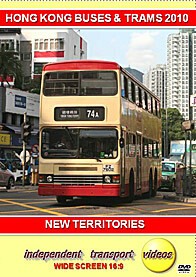 We start our final programme of the 2010 trilogy, with a visit to the New Territories, starting our filming in Tai Po. This busy town in the north eastern area of the Territory features buses from the three main operators, KMB, New World First Bus and Citybus, as well as buses from the Long Win and MTR fleets. This ‘traditional’ town is an excellent backdrop for our filming. From here we jump on board a KMB non-air con Leyland Olympian on route 73 to Luen Wo Hui. Enjoy the sights and sounds from the upper deck of this bus because this will soon be consigned to the history books as these non-air con buses are set to leave the fleet by 2012. At Luen Wo Hui we film a number of the latest MCV bodied Volvo single deckers in the KMB fleet, as well as the new Scania Caetano bodied ones. There are still some non-air con Olympians and Dragons to see at this location which we have not previously visited. We then take a short ride on AVC2 (PE 5856) one of the new Volvo B7RLEs with MCV bodywork on route 78K to Sheung Shui for more filming. Sheung Shui is close to the border of mainland China, where the hinterland is still quite rural and smaller buses are used on the local services. Most of the air-con double deckers are not low floor, so they are the white liveried Dennis Dragons and Volvo Olympians of KMB. Low floor double deckers do appear but are not so plentiful. Our next location is Sha Tin, where we start our filming in the upper bus station, before moving to New Town Plaza to capture the buses running in to the covered bus station, and along the street. Moving west across the Territory we visit TuenMun, home to the Tuen Mun Light Rail system. We film both buses and the Light Rail vehicles at Ho Tin, Town Centre, Goodview Garden, Hoi Chu Road and the Ferry Pier. From the pier we travel on one of the latest tram sets, 1114+1126, sporting the latest livery, to the Railway Station. More Light Rail filming is done at Siu Hong before we move on to Yuen Long to capture the buses and the trams in the busy main street. Our final location on this 2010 visit to the New Territories is Ma On Shan, again another new location for us, and home to mostly KMB and Citybus. We hope you have enjoyed your visit to the New Territories, an area that has a different feel altogether from the hustle and bustle of Kowloon and Hong Kong Island. However there are just as many buses and trams for you to see and enjoy! Duration : 89 minutes (approx).